Since my childhood I had a liking towards spiritualism and respect towards my elders and teachers. All my success in finishing my grade eighth onwards with first class goes to my teachers, who always encouraged me and showed me the right path. In grade eleventh, my mathematics teacher Shri Dhanprakash Gupta had special affection for me and I was always showered with his blessings. He wore a white plain cloth (dhoti) and wooden sandals (khadoun) and lived a simple and truthful life like the old sages in India. I always felt that he always knew what was going through my mind. In 1959, he got appointment of a lecturer in a Government college and had to leave Chamadiya College, Fathehpur and moved to a college at Nahan in Himachal Pradesh. When leaving he presented me with a book 'Guru and disciple' with his autograph ‘to my best student’. Remembering him I often used to cry and I used to miss him very much. I was finding it difficult to forget his love and affection towards me, when I first met Shri Shraddhanathji Maharaj on the sand dunes of Fathehpur. I was blessed by his sight and by accepting him as my spiritual Guru; my life’s sole aim was fulfilled. It felt like I attained heaven; I had found my Guru, my God. Since then, by his grace, my life has been blessed with his memories and I have found peace in my heart. Till date I continue to feel his grace and his blessed hand on my head. 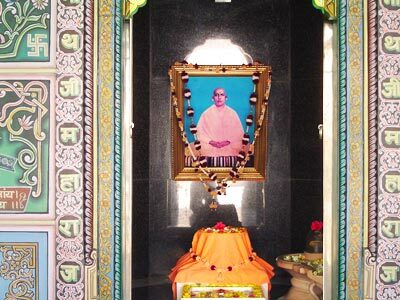 Shri Shraddhanathji Maharaj always considered Fathehpur ashram, his guru’s (Shri Amritnathji Maharaj) samadhi, as the holiest pilgrimage. Therefore he always used to frequent this place, particularly on Maha Shiv Ratri (Night of Shiva) and samadhi divas (the day Shri Amritnathji Maharaj left his physical body) which falls on ashwin shukla sharad poornima (full moon night around October in the English calendar). Shri Shraddhanathji used to come few days before the samadhi divas and would stay few days after the samadhi divas in the Fathehpur. Every morning and evening he would stroll to the nearby sand dunes, located towards north of the ashram. In 1959 I was staying in Dehati chhatrawas (hostel) at Fathehpur. One day some students from my hostel had the fortune of meeting Shri Shraddanathji Maharaj on the sand dunes. During the conversation Shri Babaji Maharaj asked the students ‘who is the best student in your hostel?’ Fortunately when the students mentioned my name Shri Babaji Maharaj asked them to call me next day to the sand dunes. In the evening the students narrated the incident to me and told me that ‘Babaji has called you tomorrow’. I replied back ‘I don’t know any Babaji’. Next day when other students left for the sand dunes, I rather than going with them, followed them with a distance. When I reached I saw Shri Shraddanathji Maharaj , sitting on a high dune and conversing with the students who were sitting around him. Quietly I also sat behind these students. The conversation started on teacher disciple relationships, when I interrupted saying nowadays one can not find teachers as in the past and Shri Babaji Maharaj replied ‘well nowadays one doesn’t find disciples as in the past’. To this, with pride, I said ‘one can find disciples’ and Shri Babaji Maharaj replied ‘if disciples can be found, so can the teachers be’. Conversation continued until sunset and one by one all students started leaving back for the hostel. Now I was alone with Shri Babaji Maharaj. I started feeling immense attraction towards Shri Babaji Maharaj. When leaving from there, Shri Babaji Maharaj asked me to sit alone for sometime that night after all students had retired to bed. I did exactly what he had told me to do. Next day I reached the sand dunes before sunrise. When he asked about my experience in the night I told him exactly what I had experienced. Upon this Shri Babaji Maharaj asked ‘now do you consider me as your guru or not?’ I immediately said yes and fell on his feet – I felt fortunate to be his disciple. After this incident I have never felt that Shri Babaji Maharaj is ever away from me. I always feel more close to him than myself. No matter how many ups and down I have faced in my life, Shri Nathji Maharaj has always taken care of me like a child. In the 1971 India – Pakistan war, amidst the heavy bombing, I was in the battlefield with Shri Babaji Maharaj’s armour.With his grace and guidance I have always been able to manage and deal with any situation in my life.